Man vs Machine on Jeopardy? Go Man! 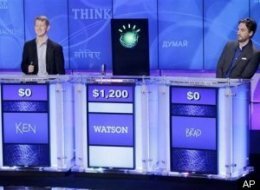 In what is perhaps the world’s most unfair matchup, Jeopardy is pitting Ken Jennings and Brad Rutter, the Jeopardy All-Stars, against Watson, an IBM Supercomputer. Watson is represented by an overblown iPod of an avatar, with a strange whirling earth for a head. Watson is also not really just a thin piece of glass, as his avatar would suggest. He is actually connected to an entire room of computers off-stage, a whopping 2,800 of them all tied together to crunch numbers and provide Watson with his answers. This adds up to roughly 1 million books and over 15 terabytes of working memory! Watson is also connected in parallel, to mimic the human brain, simultaneously using thousands of compute cores to determine answers competitively in the 3-5 second range. After the first night of play, which aired last night, Watson was surprisingly tied with Rutter with $5,000 going into Double Jeopardy. For a laugh, check out Slate’s video mockumentary on the history of Watson. It’s elemental, my dear! We’re routing for Rutter! Who do you think will win this epic, first-of-its-kind Man vs. Machine Brains Battle?! ?